Traditional Dalmatian stone built villa from the 19th century, newly renovated into a 3 bedroom villa with pool for 6 to 8 guests - offering experience of a peaceful island village life, but luxury equipped and only 10 minutes by walk from the sea and beautiful beach! Villa Maruka is situated in the peaceful old centre of the village Mirca, perfect for families looking for relaxation and a slowdown in an authentic island location. The villa consists of just over 120 meters square of interior. On the ground floor is fully equipped kitchen, dinning room and lounge with wooden beams, a fireplace and TV set and a sofa bed where 2 more guests can sleep. Next to it is an additional toilet/guest cloakroom and a small laundry room with washing machine. Master bedroom is also on the ground floor. It has a king size double bed and en suite bathroom with both bathtub and shower. From the master bedroom a french doors lead out to a pretty little terrace at the back of the house with coffee table and chairs and a small garden with mediterranean herbs and old lemon tree. To the first floor leads a grand staircase from the living room or traditional stone staircase from the outside. The first floor consist of 2 bedrooms, one with double bed and one with twin beds, and a family bathroom with two wash basins and a bathtub. One more bathroom with shower is next to the outside patio. In front of the villa is swimming pool with a hydro massage feature and attractive outside dining area with BBQ, covered with the authentic stone roof, which is traditional in old Dalmatian rural architecture. Beside the pool is a wooden sundeck with 6 sun loungers and a small garden with an old olive tree. A sundeck is positioned to capture the best views of the sea and Dalmatian coast around Split. Underneath, on the street level, is a fenced parking place. The nearest beach is only 800 meters from the villa and the nearby lively town of Supetar with its cafes, bars, restaurants and shops is within 10 minutes’ drive. SCROLL DOWN for more information about villa's LOCATION, PRICE AND AVAILABILITY , view more photos in PHOTO GALLERY or CONTACT US to book your next Croatian villa vacation! Villa Maruka has been in our family for more than 130 years. It was built in 19th century and first registered in 1881. Grand grandmother Maruka lived here with here family and run a shop at the back of the house. She had 7 children, 5 boys and 2 girls. In difficult times one of them had to leave and find work overseas at the age of 17, like many young Dalmatians. His family still lives in South Africa, but visits the old village regularly. After the second world war in communism times, all private shops were banned and Maruka's son, grandfather Stipe started to work in local cooperative shop. Other children left the village and after Maruka's death, Stipe and his family moved in a new house closer to the sea. The old stone house was empty for almost 50 years! In 1997 we bought it from other aunts and uncles and finally renovated it, this time into a modern luxury villa which welcomes guests from all over the world! Brac island is famous for its olive oil! The olive growing on the island has long tradition, but with its historic ups and downs, it is now experiencing a new revival. In Mirca, the olive growing tradition never stopped and every family has its olive groves around the village. Through these areas lead Olive grove routs: trails and gravel roads ideal for mountain biking or walking and hiking! The routs start in the old center of the village close to Villa Maruka and lead up between old olive groves, woods and mediterranean karst, with fantastic views of the sea and mountains on the mainland all along the way. 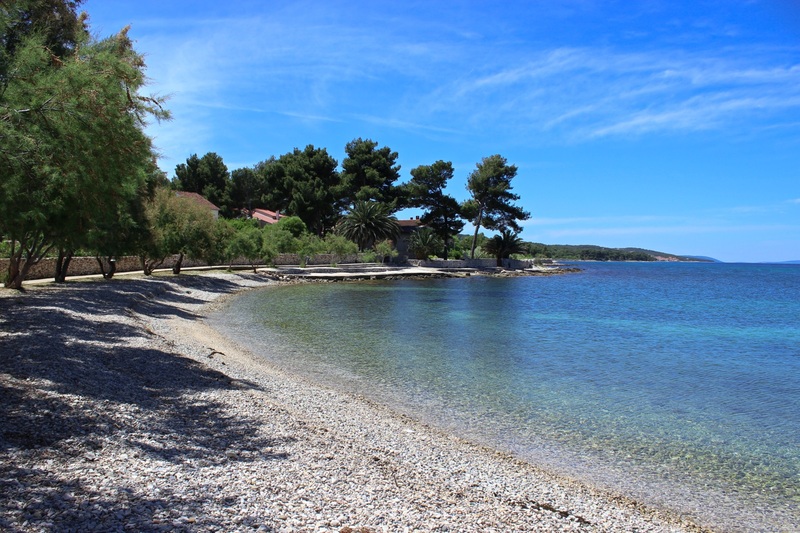 Villa Maruka is situated on one of the most beautiful and easily accessible Croatian island Brac, in peaceful old center of village Mirca, 10 minutes by walk from the beach, 3km from the lively town of Supetar and only 1 hour by ferry from the biggest Dalmatian city of Split. The place is very tastefully renovated with comfortable rooms and excellent bathrooms. We particulary enjoyed the sun deck with sea view and the outdoor barbecue area. This summer we spent a wonderful and very relaxing week with our two children at Villa Maruka. Villa Maruka is located in the quaint old part of village Mirca, tucked away from hustle and bustle of tourist areas yet offering a beautiful sea view from the terrace and easy access to the beach and the town of Supetar, shopping etc. The house was very comfortable for the four of us. The pool and the terrace area is very private and well maintained surrounded by a garden in full bloom. Sanja and her team did a superb job throughout our stay and made us feel at home. The house and service definitely exceeded our expectations and we would be happy to return to Villa Maruka another Summer. Sanja and her team did a superb job throughout our stay and made us feel at home. The house and service definitely exceeded our expectations and we would be happy to return to Villa Maruka. Our stay in Villa Maruka, was splendid. There were five of us - mum, two daughters in their early 20s and two other-halves - and the villa worked for us perfectly. It has been very sympathetically re-stored and is beautiful both inside and around the pool area, with a beautiful bright pink trailing bougainvillea along the front. It has kept its original charm but combined it with mod-cons (especially the vital air con as it was around 30 degrees when we visited in July). We made great use of the bbq/patio area too. The village of Mirca is one of the most beautiful on the island - with a church, a little supermarket and traditional farmhouses, and about a 10 minute walk to a little beach/beach bar. The villa has a great view of the sea and over to the mainland. Sanja, the owner of the property was absolutely lovely. She was very helpful with advice on places to eat (Konoba Kopacina had the most incredible lamb cooked over an open fire) and with things to do (she joined the hire car company rep when he brought our hire car to the villa to do the translating!) She was always on hand to help but gave us the space to enjoy our holiday. Thank you Sonja for a fantastic holiday. We look forward to returning soon. Lovely villa, delightful location, Sanja is attentive and helpful. We thoroughly enjoyed our stay. ﻿Lovely villa, delightful location, Sanja is attentive and helpful. Stayed at Villa Maruka with our 3 grown-up children. The villa was lovely; well appointed with large comfortable beds and super bathrooms with endless hot water. The villa is situated off main road in a delightful village with a useful shop. The decking area for sunbathing got plenty of use. The pool is small, but good for cooling down. There is plenty to do -we did sea kayaking, hired a boat, visited the monastery at Pustinja Blaca (well worth the walk,but watch for pot holes and scratchy bushes on the drive down) and many of the beautiful little villages and ports. Also had a day in Split -the old town is amazing. Sanja is a treasure. She is a mine of information and endlessly willing to help book restaurants, boats, or whatever you need. We did sea kayaking, hired a boat, visited the monastery at Pustinja Blaca and many of the beautiful little villages and ports. Also had a day in Split- the old town is amazing. We (me, my wife, two children (2 and 4 years old) and my parents-in-law) spend a amazing holiday in Villa Maruka and in Brac island. The both beat our expectation. We enjoyed excellent facilities of the villa and our kids really loved the pool! The villa is situated in a small and quited village which is a perfect situation for a relaxing vacation with the family. All needed services was nearby and a car trip to Supertar's services (restaurants, superstores etc.) took only about 10 minutes. We had a car rented for the whole week and we made several car trips to another small villages and beaches in the island. Sceneries were incredibles and the sea was already warn enought to swim. How the sea water can be so cristal clear? Thanks Sanja for your warm hospitality! Sceneries were incredible and the sea was already warn enough to swim. How the sea water can be so crystal clear? Villa Maruka exceeded our expectations! Very pretty, spotlessly clean and well equipped. The bedrooms were all well furnished with lovely large comfortable beds and the bathrooms were wonderful as well. The pool, the decking area and the outside dining room were so special, you could just lie there in total peace or enjoy a BBQ with a large bottle of homemade wine! Sanja was amazing, she helped us settle in and asked us what we would like to do whilst on Brac, she arranged car hire, bike hire, a scuba diving trip and a day excursion to Hvar.....nothing was too much trouble and we all liked her very much. You really do get what you pay for here, and the little village of Mirca was so pretty, very quiet with a church, a couple of small shops, a very good restaurant and a beach bar, what more do you need? We were a party of 6 including 2 children and we all agreed that this was one of the best properties that we had stayed in and thats saying something as we have all travelled around the world. Go on treat yourself to a holiday here. We all agreed that this was one of the best properties that we had stayed in and that's saying something as we have all travelled around the world. Go on treat yourself to a holiday here. We are on Tripadvisor! Read or write reviews here.